Girl Kuripot Girl Kuripot: Win 30 Trips in 30 Days with Intrepid Travel! Share This on Twitter! 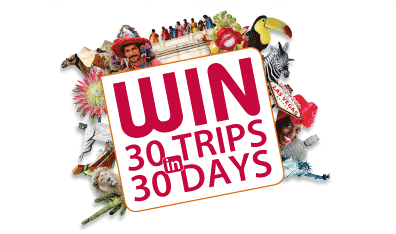 Intrepid is giving away 30 Trips in 30 days! Camp at a cowboy ranch... USA! Learn to surf on a deserted beach... Australia! Kayak on Milford Sound... New Zealand! Stay in a village by the Nile... Egypt! Trek the Sahara by camel... Morocco! Come face to face with penguins... Antarctica! Hike the Inca Trail... Peru! Learn to tango in Buenos Aires... Argentina! Go on an African safari... South Africa! Chill out on Zanzibar... Tanzania! Discover South Indian cuisine... India! Walk the Great Wall... China! Sail aboard a junk on Halong Bay... Vietnam! Experience rural life in Cambodia... Cambodia! Meet locals on the Trans Siberian... Russia! Cycle through Tuscan towns... Italy! Take your pick! Click on your favorite postcard to enter. You can submit one entry per day until November 30, 2010.
i want to cycle through the Tuscan towns,hike the Inca trail, do the tango and grab a penguin hahah! d nga ako makapili!hahaha. i want the penguins and kayaking the most hehe.imagine mo if u win grabeng experience.